The majesty of the Danube and the great cities nestled along its route have been the creative trigger for great works of literature, art and music. This enchanting river presents the most romantic and scenic way to travel between central and eastern Europe. 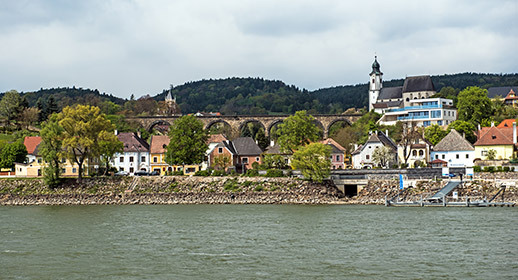 This week-long cruise perfectly combines three exceptional capital cities – Vienna, Bratislava and Budapest – with beautiful Danube scenery including the Wachau Valley. Titan’s VIP door-to-door travel service collects you from home, for your flight to Vienna. Upon arrival, embark MS Bellejour (4T), where light refreshments are available. A welcome cocktail and Captain’s gala dinner are served this evening. Spend this afternoon discovering Linz, a city that combines its heritage with a healthy interest in the future. You may consider choosing an optional walking tour of the city, or perhaps take in one of the most important collections of Austrian art history and folklore at the Schlossmuseum. A full day in Passau, the town built on the confluence of the rivers Danube, Inn and Ilz. Spend your time discovering the city at leisure or on an optional guided walking tour. Through its Old Town, the 17th century creation of Italian Baroque masters, cobblestone streets take you up to St Stephen’s Cathedral, home to the world’s largest cathedral organ. We arrive in the sleepy town of Melk, dominated by its resplendent Benedictine abbey, which we visit on our included excursion. The baroque monastery is home to a particularly impressive church embellished with gold, marble and many frescoes. Later this afternoon we cruise through Austria’s Wachau Valley. A full day in Vienna, one of Europe’s most beautiful cities with a rich culture of arts and music, and proud to be able to list a large number of highly esteemed composers as past inhabitants, including Mozart, Brahms and Schubert. We embark on a city tour by coach this morning to introduce you to the fine baroque churches, palaces and concert halls. A special event is included on board after lunch, for those who wish to take a lesson in waltzing. The evening brings with it an optional concert of classical music at one of the impressive palaces in the city. We awake in Slovakia this morning and embark on an included tour of its capital, Bratislava, on the city’s tourist train. See the lovingly-restored Old Town and the imposing Bratislava Castle (Hrad), which towers over the city. With a total of eleven kings and eight queens crowned within the castle’s white walls, and a communist legacy, the city has a full history. The last leg of scenic cruising commences, as we head to Budapest whilst enjoying the Captain’s farewell gala dinner. An included tour this morning introduces you to this fascinating city. With many monuments reflecting its long history, from Roman, Turk and Ottoman occupation; as well as riverside promenades, flea markets and antique shops, there are many ways to fill the remainder of the day.